The Walking Dead Review: "Wrath"
You know Josh, for an episode named “Wrath,” was it not somewhat surprising that this season finale was more or less … wrathless? For a couple of weeks, we’ve been making predictions about who will survive or be killed in this finale episode—long established by The Walking Dead as the only episodes where major characters can die—and instead, it threw us a curveball by killing … nobody. Not a single member of the Grimes Coalition met their end, OR a single one of the prominent Saviors (the ones whose names we know). Not blind Gabriel, who was flinging himself from a moving vehicle, or two-timing Eugene, or even expendable Tara. Not one! I was expecting someone to go out in a heroic sacrifice or blaze of glory. Instead, the final confrontation between the two groups seemed to sort of conclude itself in an anticlimactic flash. Much of that is due to Eugene, who proved to be the episode’s biggest player in terms of impact on the plot. He definitely had us completely fooled, I must admit—we bought into the fact that he had gone full-on bad guy, when instead he had apparently just gotten much, much better at hiding his ulterior motives while sabotaging all of the Savior ammo. I suppose I should probably feel at least somewhat vindicated, as I have been claiming all season long that Eugene would ultimately side with the Grimes Gang at a pivotal moment. Of course, does it make sense that every single one of the Saviors would be using the ammunition made the day before? Nope, but you can’t ask this show to “make sense.” It gave up on stuff like that a long time ago. Speaking of things that made no sense: The Oceansiders showing up at the perfect moment to assist in defending The Hilltop, in what was ultimately a completely inconsequential scene. Imagine being one of those actors, Josh. They’ve probably been told all season long that the Oceanside group would play a really important, “pivotal” role in the final outcome, and instead they showed up for about two minutes and tossed some Molotov cocktails at some nameless Savior extras. I don’t know how you could avoid being disappointed. But anyway—onto the big, meaty topics of discussion. 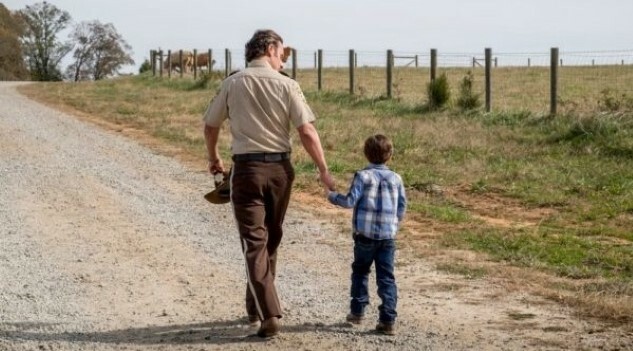 The war is over, and after Rick used the idea of his son’s goodwill to once again get someone to drop their guard, Negan has been physically vanquished. However, he’s not dead. Despite sustaining a wound that nobody should really survive—Rick cut him across the neck like Ogami Itto in a Lone Wolf and Cub manga—he was instead saved by Siddiq as instructed, which brought forth a pretty powerful reaction from a devastated Maggie. It was an interesting confrontation, but I wish that they had thought of a more logical way for Rick and Negan to have a one-on-one showdown, rather than acting as if the leaders of these two groups can just carry on a fistfight while 100 yards away from Rick’s heavily armed group. They just stood there and let the two guys fight it out, Josh. Ultimately, Rick believes that allowing Negan to live is a necessary component of bringing Carl’s vision for the future to some kind of fruition—which he hilariously described to the defeated Saviors as “living in peace and fairness.” He believes that Negan will be “evidence that we’re making a civilization” as he spends the rest of his days in a jail cell, presumably in the rebuilt Alexandria. Negan will theoretically be the person that they point to in the coming years when taking in new recruits, saying “we don’t tolerate none of that kind ‘o tomfoolery here, you got that?” Or something. Which leads us to what is by far the most interesting moment in “Wrath,” in Maggie’s board room—formerly Gregory’s office—in The Hilltop. There, she’s meeting with Jesus and Daryl, and it’s clear that she’s feeling quite disgruntled about Rick’s failure to kill Negan. To be fair, this is something that Rick has promised to do on numerous occasions, but I couldn’t help but feel that this scene came across as manipulative and dramatic for the sake of drama. I refuse to believe that Maggie, Jesus or Daryl is ever going to actually try and get some kind of comeuppance on Rick for how he handled a final confrontation that was, may I remind you, completely bloodless. What do they have to be angry at Rick about at this point that they wouldn’t already have been carrying with them? This is nothing more than a blatant attempt to stir the pot and manufacture a little drama in between seasons. Sure, maybe they attempt to somehow take out Negan down the line for the sake of revenge, but the sinister way they shot the scene, and Lauren Cohen in particular, is clearly meant to get the audience to speculate she’s somehow going to turn on Rick, or become a villain. And that’s an idea so stupid that I can’t believe that even the folks who write The Walking Dead would be able to convince themselves it was good. So I’ll believe that when I see it. Where does that leave us, then? Will the show move forward with the “time skip” next season, thrusting us a few years into the future of these communities as they build up? Something is telling me that this won’t come to pass—if only because they want to milk the drama with Maggie that they just established. However, there are questions that definitely need answering. What kind of community does traveling knowledge peddler Georgie belong to? Is it related to the helicopter people? How will Jadis/Ann adapt to life among the average Joes? Okay, I sort of want to know the answer to some of those more than others. First, props where it’s due: We were all expected an epic final battle this week—the previews featured explosions and armies amassed for the big showdown. Eugene had us fooled, but not in a way that was contrary to his character. And we’d been teased all season with Rick, bloodied and crying in apparent anguish at what has happened. Turns out, it was all a feint, and season full of gun battles, explosions and zombie bites ends in a series finale without much action at all. I know, The Walking Dead still has 15 seasons to go before AMC will pull their cash cow off the air. But for me, that was the end. And it was actually a reasonably satisfying finish as recent episodes of the The Walking Dead go, though I wish I’d skipped the scene where Maggie, Daryl and Jesus—Jesus!—are plotting to overthrow Rick and Michonne—Michonne!—for their act of mercy. Daryl, I could believe. Maggie, in all her justifiable rage, only stretches the bounds of imagination (though, it’d make much more sense for her to just kill Negan instead of whatever nefarious plot they have in mind). But Jesus has been the biggest paragon of mercy on the entire show. Why Maggie would even approach Jesus in this already contrived-feeling dramatic device blows apart all credulity. So, for me, this was the point at which I must pass the torch to you, Mr. Vorel. I’m having so much fun writing about Legion right now, and I would encourage everyone to join me on Tuesday nights. But as of today, The Walking Dead becomes a comic book again. I have dozens of issues to catch up on. And, of course, I’ll read your recaps next season to see if maybe the show has recaptured the magic of those early seasons. But back to the finale—it marked the biggest line of delineation in the series history. The kind of show it will necessarily become next season is completely different from what it’s been. We’re very clearly in a new phase of the post-apocalypse where we’ve entered rebuilding mode with multiple villages working in apparent harmony. There are other communities out there, but if Georgie is their representative, they don’t pose too much of a threat. Maybe the helicopter people are some kind of cannibals (no, wait, we’ve done that) or deranged killers who believe they must wipe out humanity (no, wait, we’ve done that), but they’ve probably settled into their own rebuilding phase if they’re flying helicopters around. The drama will have to come from within, which is probably why they’ve introduced this big internal split. And I know you really don’t care how Jadis/Anne adapts to life among people who speak in modern English (or Shakespearean English), so I’m not even going to bother answering that question. Instead I’m going to remember the best moments of this show over the years. That gripping first episode when Rick wakes up in the hospital room. His ride on horseback through the streets of downtown Atlanta and the voice of Glenn guiding him to safety when he’s in the tank. The heartbreak of seeing Sophia walking out of Hershel’s barn. The introduction of Michonne and the exploration of her whole backstory. The claustrophobia of the prison. “Going Clear.” David Morrissey as The Governor. The Walking Dead was unlike anything we’d seen on TV before, a zombie show that explored essential human questions. Please don’t become the show’s chief villain, Daryl Dixon.